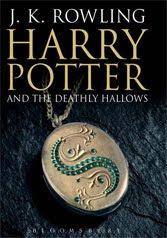 That is very interesting, because before reading this book, I had thought the Deathly Hallows would be a time, a time of ill-luck perhaps, or a time under a curse, or a time when magic wouldn't work. I was very surprised to find they were objects. As always, your comments are perceptive, and fair points. And yes, that would be very interesting to know what J K Rowling is writing now!